Unusual Italian glazed pottery or Majolica umbrella stand featuring a brown bear hugging a log or tree branch. This umbrella stand dates from the 1920s. This versatile Hollywood Regency piece has a Black Forest look and could also be used as a planter or jardiniere. This piece is in very good vintage condition with no cracks. 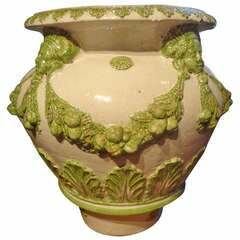 Classic Italian glazed terracotta jardiniere/urn (22 inches H) decorated with masks and garlands. 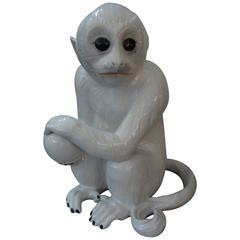 Italian Mid-Century Hollywood Regency white glazed pottery sculpture of a monkey, marked Italy, circa. 1960. Rare large stoneware umbrella stand designed by David Cressey for the Architectural Pottery pro or artisan series. A rare find in this artisan crafted exotic woods, and crystallized Lucite umbrella stand, or floral displays. Vintage Italian brass umbrella or cane stand with patina, can be polish for additional cost. Minor dings. An elegant Italian umbrella stand with marble base. Gilt metal. Heavy and well-made, circa 1950s. Umbrella stand with brass and iron structure and wooden details. Italian production 1950s. Super elegant umbrella stand in brass and lime green metal with a zigzag pattern. The cup for water is in original condition and can be lifted out to remove water.